While giants like Dyson are bringing innovation for a wallet breaking price, Shark Ninja has been trying to meet the need for quality at affordable costs. 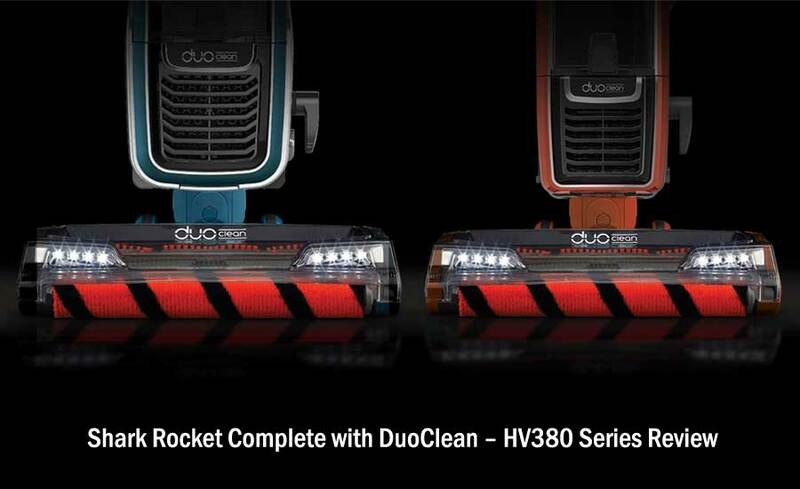 Shark Rocket Complete with DuoClean HV380 series is an example of that. In this series, Shark has introduced a new DuoClean technology that was not included in any of its prior models. 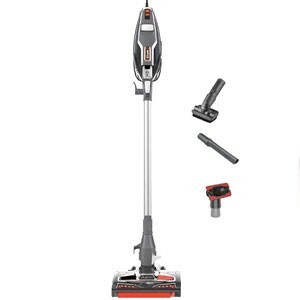 It is Shark’s most advanced upright stick vacuum range as of September, 2017. The HV380 series has promising features and an abundance of variants. In this article, we will thoroughly analyze them in the form of a Shark Rocket DuoClean reviews. What is the DuoClean Technology? Shark was not exactly the visionary of the concept behind the DuoClean technology. Other brands have introduced their versions of this technology before. Shark’s take on it is simply two brush rolls operating simultaneously. It is not as plain as it sounds, however. The cleaner head is comprised of two different kinds of brushes – a soft brush roll and a bristle brush. The bristles agitate headstrong debris and the soft brush roll sweeps dust inward for a swifter pick up. It is claimed to perform a Triple Particle Cleaning job by picking up small, large and fixed debris from all floor types. The DuoClean brush head would succeed in situations where the single brush heads could not perform adequately. You might like the Shark navigator VS rotator comparison guide. All Shark Rocket DuoClean variants share the same core features. The only way to tell them apart is by color schemes and accessories. In case you are in a rush, the following chart displays the product specifications of the DuoClean base model HV380. All variants have these in common. To find out how each variant differs from all the others, scroll down to the Variants section. Note that the cleaner head attachments were left out from the product specifications chart. No set of accessories is the same as that of another variant’s. We will cover them in the later part of this article. The Shark Rocket DuoClean has five noteworthy variants. Each variant comes with its diversified and unique set of tools. It is quite evident that the variants were each made to meet different sorts of cleaning needs. The HV380 is the basic model of the series. It is the one we have just discussed above. Yet we have saved its unique tools to be discussed in this part. Upholstery tool: This tool is for getting fine dust and pet fur out of fabrics that are on top of furniture or stairs. It is to be used in when the vacuum cleaner is in the handheld mode. 12 inch crevice tool: The crevice tool is for cleaning the hard to reach areas of your home – be it ceiling, wall or underneath furniture. Dusting Brush: It is a non-motorized tool as well. The dusting brush dusts of fine dirt from the surface. It is ideal for cleaning on top of furniture. The HV381 comes with the following additional tools, apart from the ones we discussed in the base model review. Under Appliance Wand: This is a long pipe-like tool with a narrow width. The under appliance tool, as you can guess, is for cleaning under and behind appliances like refrigerator, washing machine and such. Its long, slightly pointy shape allows it to reach under most appliances. The suction when this tool is attached is more than adequate. Pet Multi Tool: The pet multi tool is a handy attachment to ensure thorough cleaning of pet fur around the house. Duster Crevice Tool: Its purpose it the same as the traditional crevice tool, to reach places you cannot usually access. The difference is that the cleaner head is a duster instead of bristles. Accessories Bag: Shark provides an accessory bag with this variant to store all the tools and attachments. This is the TruePet version of the DuoClean series – Shark’s best candidate aimed at pet owners. TruePet Mini Motorized Brush: This tool is the heart of this model. It is a snap on tool with a motor right inside the cleaner head. It delivers a powerful agitation due to the close proximity of the motor and the surface. Even when pet hair has meshed with carpets and fabrics, it can pick up pet fur that you did not even know was there! The above set of tools is almost the same as what comes with the original HV380, with an exception of the under appliance wand. Dust-Away Floor Attachment: This attachment is specifically designed to clean hard floors. A microfiber mop is attached to the cleaner head. It sweeps bare floors with care. How do these specifications pan out in practical cleaning? Let’s not put off the answer to this question any longer. Dive into our Shark Rocket DuoClean complete review below to see the big picture. The Shark Rocket DuoClean is an upright stick vacuum cleaner. It is light but not cordless. The power cord is 30 feet in length and without auto unwinding. Shark has put a lot of thoughts into the build and design section of the Rocket DuoClean. Assembling and disassembling the vacuum cleaner is no rocket science. All the instructions come in the manual. 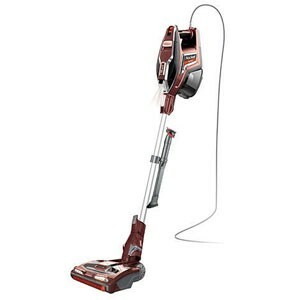 Shark Rocket DuoClean is a 2-in-1 vacuum package. It can be converted from a stick vacuum to a handheld. This allows you to extend your cleaning area from floor to walls and ceilings. When converted to the HandVac version, the unit feels quite heavy. Some users may struggle to uphold the handheld for longer periods. Though it is not very likely. Shark has designed an ergonomic handle on the top. It has three settings – off, bare floor and carpet. Including the ‘OFF’ option was an improvement compared to their DeluxePro series which had none. In the previous Shark models, getting access to the motorized brush was not so easy. You had to remove the cleaner heads and unscrew a bit here and there. In the Shark Rocket DuoClean, the upper side of the floor base is built removable. This leaves the motorized brushes on the inside open for cleaning. This mechanism is called the brush roll garage. It lets you clean the motorized brushes without even having the cleaner heads face toward you. There is an onboard storage clip for convenient storing of tools. There are bright LED lights near the floor base but they cannot be turned off even when you do not need them. It can be annoying at times. 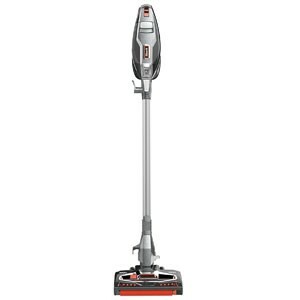 The cleaner head of the Shark Rocket DuoClean is composed of two motorized brushes. From our speculation, the soft roller cleaner head picks up medium to large debris. The bristles pick up fine dust. The new cleaner head is supposed to pick up fixed debris too, as a part of the Triple Particle Cleaning feature. the rocket DuoClean was able to pick up pet fur, large particles and fine dust. It took a few sweeps of the vacuum cleaner over messy spots. But at the end, the floor was spotless. The soft roller brush handled the large particles. The bristle brush sucked in whatever was left off by the former. To remove stuck on debris, you have to spot them first and have the vacuum cleaner linger there until the debris is picked. It takes only a few seconds and we are not complaining. Remember to use the bare floor setting the upright vacuum comes with. The bare floor setting (setting 1) has less suction so that delicate bare floors do not get damaged. Small rugs can be cleaned in this setting too. use setting 2. This mode provides maximum suction to pull out dirt from the depths of your carpets. The Shark Rocket DuoClean had no problem picking up pet hair, fine dust and large debris from even the thickest carpets. The bristle brush took care of the pet furs and grounded dust particles. Long story short, the Shark Rocket DuoClean picked up everything we threw at its way. We found a second pass to be able to clean all of the dirt from a surface. Sometimes the vacuum cleaner fails to do back sweeps. It puts up a little struggle to pull itself forwards. The suction never fades during a cleaning session. 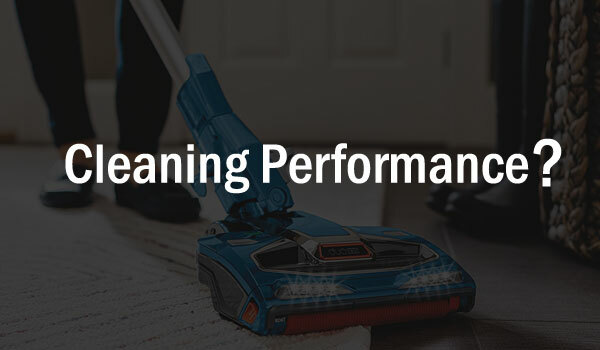 We conclude that the cleaning performance is marvelous. Note: The cleaning performance described above is true for all Shar Rocket DuoClean models. To know how different sets of accessories affect this, see the Variant section. Shark Rocket DuoClean comes with 3 filters none of which are HEPA. Many consider HEPA filters to be a must have inclusion in a premium quality vacuum. These filters remove tiny dust particles and allergens from air, purifying the air you breathe. Other brands have incorporated HEPA filters in cheaper units. This is one shortcoming of the Shark Rocket DuoClean that we cannot look past. Though not as good as HEPA filters, the filters enclosed into the Duo Clean function well and serve their purpose. There are one post motor and two pre motor filters in the Shark Rocket DuoClean. One of the pre motor filters is foam material and the other is felt. All three filters are washable. If the filters get clogged up, it can result in a poor suction. You should wash the pre motor filters once every month. After rinsing, letting it air dry for a day will be crucial. Thanks to “Shark Cleaning” for making a video walkthrough. Check this 1-minute video on filter maintenance. The dust cup in the Shark Rocket DuoClean is a nice, transparent one. If the vacuum cleaner picks up anything of importance, you can see and recollect that. The dust cup can hold up to 1.0 dry quartz of dirt and debris. For a vacuum cleaner of this size, there should have been a larger dust cup. The dust cup will fill surprisingly quickly if you set out to clean your entire house. This is a major inconvenience because the vacuum cleaner has a superior power configuration and cleaning tech. Only a larger dust cup would have suited this powerful a vacuum cleaner. For long cleaning sessions, frequent trips to the garbage can are expected. Emptying the dust cup is hygienic enough. You do not have to touch the dust cup at all. You have to first eject the dust cup from the vacuum cleaner body. Place it over a trash can and press the release button. The bottom of the dust cup will fling open and dirt will be dumped in the trash can. However, the dust cup has a raised flat disk inside it. Dirt tends to get stuck onto it and will not come off even when you empty the dust cup. In such cases, manual intervention is needed. Even though it is called an upright stick vacuum, the Shark Rocket DuoClean can’t stand on its own. This is due to a flaw of design and imagination. During the cleaning session, you have to always operate it directly if you do not want it falling down. If you have to perform another task with both hands, the DuoClean has to be laid on the floor first before letting it go. The 30 feet cord allows you to clean large rooms without having to plug it in a different switchboard. The weight of the vacuum cleaner in the upright stick form, is nothing to bat an eye at. But due to the model’s incapability to remain in a standing position by itself, most of the bulk is distributed to your hands. Using it for longer periods of time can affect maneuverability and cause discomfort. Converting the unit from a stick vacuum to a handheld and vice versa is very easy. The weight of the handheld may seem to be a burden from time to time. The LED lights provide visibility in darker cleaning areas. Whatever the lighting of the room, you get to see if there is dirt on the floor within the radius. The lights turn on automatically and cannot be turned off. So when additional lights are unnecessary, you cannot really do anything about it. The swivel steering of Shark Rocket DuoClean is a better one than the Shark Rocket DeluxePro’s. It delivers a smooth steering allowing for a better control of the cleaner head. In fact, it is so good that making multiple passes on the same spot does not feel tiresome. The brush roll garage can be the difference of a hundred bucks if the motor ever gets clogged. You will be able to easily access and clean it yourself. Two accessories can directly be stored on the vacuum using the attachment clip. This way, the tools you use the most will always be close. Storing the whole unit itself can be done in multiple methods. You can detach the handheld part and hang it from a hook on the wand. Apart from the other obvious option, mounting it on the wall, it can be kept leaning against wall or furniture. The last option is very space consuming and should only be temporary mean of storage. The wall mount is the most convenient storage solution out of all the available ones. As a recap or summary of the in-depth analysis above, we will go over the pros and cons of the Shark Rocket DuoClean for a quick observation. Whom is Shark Rocket DuoClean Perfect for? First of all, the price and feature combo of the Shark Rocket DuoClean is nearly unbeatable. If you do not mind the minor conveniences like frequently emptying the bin or its inability to stay in an upright position, the Rocket DuoClean can prove to be an ideal vacuum cleaner. If you have to deal with fixed debris on a regular basis, the DuoClean would be a smart choice. The sets of attachments are very versatile. If post purchase service is very important to you, the 5 year warranty is a pretty lucrative deal. 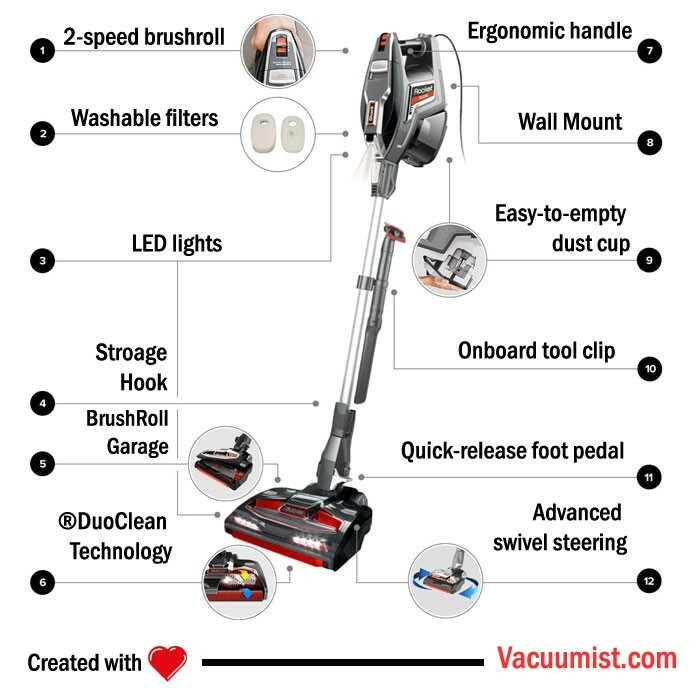 If you prefer you vacuum cleaner to clean floor to ceiling and everything in between with a strong suction power, the Duo Clean is highly recommended. Needless to say, you will save money too. 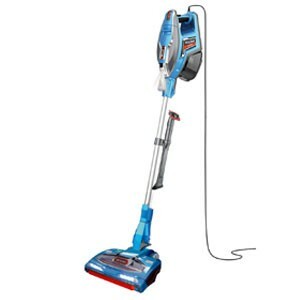 Shark Rocket DuoClean is a powerful and reliable vacuum cleaner. Its cleaning capabilities surely raised our eyebrows. The premium 5 year warranty ensures that the superior quality of the unit is sustained. 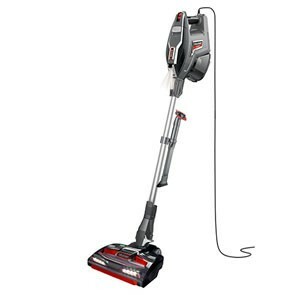 In this price range, we cannot think of a better vacuum cleaner than this one. You will get a variety of tools with whichever variant you choose. Just think about which ones you will actually apply and choose wisely. I have a shark rocket HV 380 complete. It cleans great and is super easy to use. At only 5 months old it has had to have the motorized floor unit replaced twice, and I think the third one is about to fail. (burning rubber and plastic smell) My dogs long hairs are easy to clean off of the rollers but they accumulate and wrap around behind the plastic gear which drives the brush roller, where they are virtually impossible to remove. Eventually, they stop the gear from turning and the drive belt overheats and burns out, accumulating so much heat that it melts a hole in the side of the unit. Shark does not seem to want to address this design fault. I have a 5 year warranty but I wonder how many replacement units Shark is willing to send me!!! Have you been contacted by anyone else with this problem? I didn’t hear such a complaint till now you complained about it. Yes, I have heard about excessive hair wrap, but not one that results in burning internal parts. If you have a pet or pets that shed a lot, I think this is not a very good choice. Vacuum cleaners which prevent hair being wrapped in the brushroll are available nowadays. Anyway, my solution will be cleaning the brushroll more frequently, I know this is not a solution you were seeking for but what else can be done? And taking replacements from shark as long as you can.